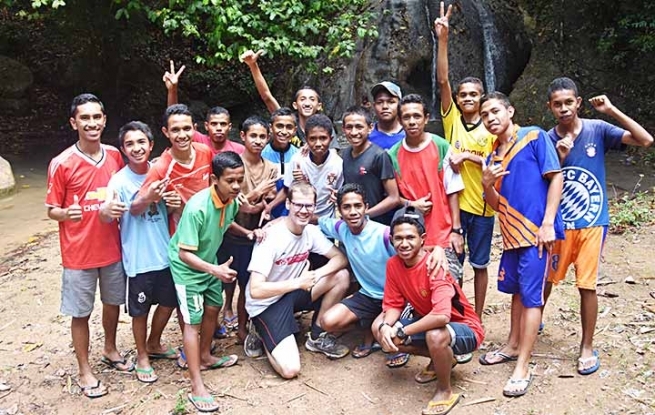 (MissionNewswire) Salesian student Simon Mühlbauer, 19 years old and from Germany, was a recent volunteer with the Don Bosco School in Fatumaca, East Timor. Mühlbauer, who is about to start university in September, had attended a Don Bosco high school in Germany that each year had a day dedicated to social work projects to better his community and those in need. He had heard of the volunteer work offered by Salesian programs around the globe and decided to become a volunteer. Mühlbauer spent eight months with the Don Bosco School in Fatumaca, teaching when he could and engaging the students during free time and other social activities. Once he become more acclimated in the second half of the school year, he was fully integrated in the school schedule and taught more classes. Mühlbauer organized his own English courses for the primary and junior high school and took advantage of other opportunities where he could assist when they became available. Salesian missionaries provide a range of educational and social development services at the Salesian complex Don Bosco Fatumaca. Don Bosco Technical School provides vocational education that helps youth gain an education and prepare for the future. More than 250 students, 11 percent of whom are girls, attend the school taking three-year courses in carpentry, mechanics and electronics. The complex also offers a primary and secondary school for young students from local villages and a successful agriculture school with programs that reach 15 of the surrounding villages. Poor youth are able to access a range of programs at Don Bosco Fatumaca including health services, nutrition, education and general support services which help students prepare for an independent future. The schools also offers room and board for students who need on-campus housing. East Timor is home to 1.1 million people and according to the United Nations Development Program Human Development Index, the country ranked 133 out of 188 for life expectancy, access to education and standard of living in 2015. The World Bank estimates that East Timor has close to 49 percent of its population living in poverty with over one-third of the population regularly experiencing food shortages. In addition, close to 50 percent of the population is illiterate.